Give Deandre McLeod props for pulling out every trick in the book to elude arrest for armed robbery. If only he applied his ingenuity to legitimate means of making money. The 20-year-old Hayward resident had been a fugitive from justice for a month after robbing an elderly Fremont woman of her gold necklace on October 5, according to a couple of Fremont Police Department press releases. 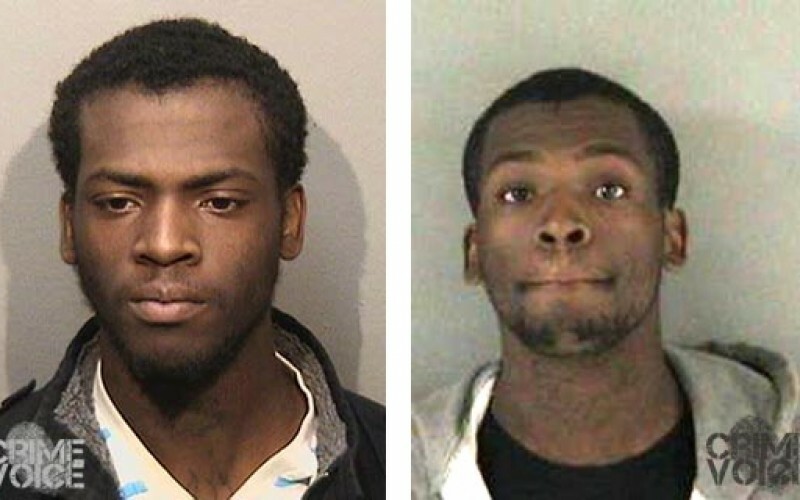 McLeod and his accomplice, 20-year-old Dantay Freeman of Antioch, drove to Fremont to commit the robbery, according to police. Freeman waited behind the wheel as McLeod approached the woman and her husband, who were taking a stroll through their Ardenwood neighborhood in the area of Maybird Circle and Platinum Terrace. McLeod snatched the gold chain from the woman’s neck and ran. 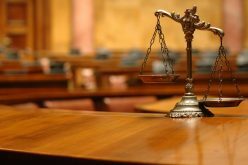 The woman’s husband pursued McLeod, until McLeod turned, took out a handgun and pointed it at the husband before firing two warning shots into the air. For whatever reason, a third shot was fired as McLeod turned and continued to flee. Witnesses saw McLeod get into the car with Freeman before the pair drove off. They gave police descriptions of the suspects and the vehicle’s license plate number. As a result, Fremont and Antioch police were able to arrest Freeman at his Antioch residence on October 14. 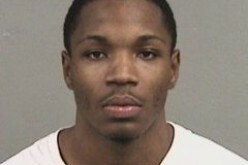 On October 16, around 8 p.m., police tracked McLeod to the E-Z 8 Motel on Cedar Court in Newark. 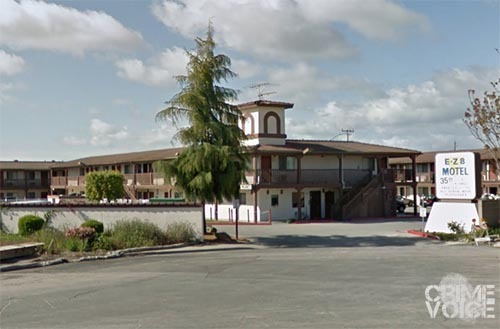 A SWAT team made contact with the suspect, but McLeod again managed to slip through their fingers by hopping a fence near the motel and crossing Interstate 880, prompting an hour-long freeway shutdown by police. Police believed McLeod might be hiding in the bushes along the freeway, but they later learned from witnesses that he had been spotted crossing the Interstate and going into the Starbucks on Mowry Avenue near Farwell Drive, from where he apparently contacted a female accomplice who came to pick him up in her car. 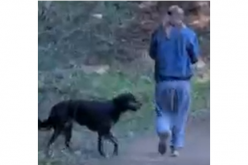 McLeod went to Starbucks (right) to get help after he escaped over the freeway. It is unclear if McLeod tried the Pumpkin Spice Latte as he waited for her. 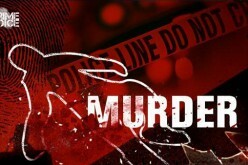 Frustrated, investigators turned to the Fremont Police’s Street Crimes Unit and Investigative Unit to help find McLeod. Both units have expertise in locating suspects who repeatedly manage to elude police. On November 5, the specialty units, along with several SWAT team officers, pinpointed McLeod outside his mother’s apartment in San Leandro. The Alameda County Sheriff’s Office provided several units to assist in the arrest. 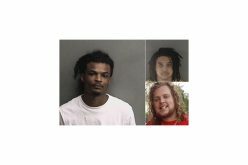 McLeod nearly escaped capture yet again as several friends attempted to drive him away from the apartment complex. But police rushed in to stop the car before McLeod and his crew made their getaway. Remarkably, McLeod still had a couple of tricks up his sleeve. He claimed not to be Deandre McLeod, giving police a false name instead. When that didn’t work, he tried bribing officers as they hauled him off to jail. 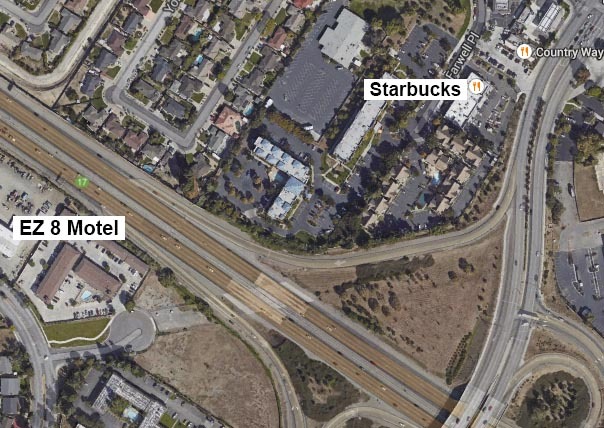 A Google Maps image shows the path from EZ8 to Starbucks over the I-880 Freeway. McLeod was booked into the Santa Rita Jail in Dublin on a laundry list of charges, including armed robbery, assault with a deadly weapon, felon in possession of a firearm, falsely indicting another for a crime, giving false information to a police officer, obstructing and resisting arrest and violation of probation. McLeod’s bail has been set at $60,000. 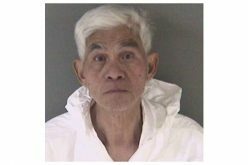 He is due to be arraigned at the Fremont Hall of Justice on November 7. Meanwhile, someone might want to move the bars of McLeod’s jail cell closer together.